Tech Health Today | What is the technology of healthcare today & what does it mean to you? What is the technology of healthcare today & what does it mean to you? Well, I learned a new acronym last week. Kinda catchy. And makes me chuckle. I’ve focused on wearables quite a bit on this site and talked about integration with the care provider’s systems. But, it seems, there is a whole world of “things” that I may have been leaving out -especially when it comes to cyber security. It’s the “Internet of Things”! And for those in healthcare IT we go even further to say IoMT – Internet of Medical Things. So let’s flip the situation: If that care provider’s IoT has been compromised and your device (iPhone, iPad, etc) connects to it at the provider’s office could it compromise your device? Though most health systems have made advancements on the cyber security front those small rural areas who have just been struggling to get internet at their facilities are well behind the ball of the huge health conglomerates. Another aspect is the massive numbers of IoMTs that must be addressed. By 2020, 78.5 million number of people worldwide will be using home health technologies … By 2019, 87 percent of healthcare facilities will implement IoMT, up 60 percent from this year. Cyber security, to me, seems to be a swiftly growing “next big thing” in IT. And that doesn’t apply to just the medical arena. It applies to your bank, your home internet, and the nail salon where you might connect to their internet while they paint your toenails pink. Looks like we’ve got another topic to follow on here! You are wearing & using health apps but is your care provider using that info? As you know I follow the mHealth world from the perspective of the patient. Recently I read an article that gave some data on the use of mHealth apps and what the care provider is doing with it. I was genuinely surprised at the statistics. The article (patient wearable data use) states that while 41% of Americans use the technology only 6% of the care providers were currently using the data from the patient. Working in the healthcare IT field that, as I said, was surprising. While in the field we are starting to use software allowing more patient access to patient’s information it seems we are slow to the start. Another statistic that surprised me was that 29% had no intention of using the data. A while back, I contributed a blog post that spoke of the use of mHealth data affecting who we choose as care providers – perhaps we want to utilize care providers that are actually using our data and with whom we can see the information from our visits to take more proactive steps in managing our health. Following that train of thought does this mean that the utilization of your data (well, maybe your data) is 94% just not happening? So we, as patients, want to see our data, often a constant effort to collect by the patient, and the care providers data and notes but we do still want that care provider to use the information in a face-to-face/human interaction and view that as an optimal care scenario. Do you use health apps? Does your care provider use your data? And how important are the two factors – use of data and transparency of data and/or human interaction – to you? …will keep the doctors informed. So maybe you haven’t been in the hospital ever or in years or even this year (we’re only a quarter-ish into the new year)… but now you just might see how an Apple might be just what the doctor ordered. If you are already wearing that Apple Watch and happen to make it into the patient bed at Cedars-Sinai then you can synch all your info with the hospital issued iPad and your Apple Watch. That makes for a more complete record of your health and keeps the info where it can be accessed for other care providers or, in the worst of situations, where emergency responders can see it. Back in early 2015, we heard of the hospitals piloting Apple’s HealthKit – and the big name electronic health record providers jumped in with them. John Hopkins (specifically for epilepsy) and Ochsner Medical Center in New Orleans have worked with Epic, an electronic health record company, to integrate with the Apple Watch. Ochsner is making the use of the Apple product line to make their innovationOschner (iO) program a stellar role model for the rest of the electronic world of healthcare. I’m, personally, impressed with their program and how they seem to be making it a part of their strategic vision not just for the company but for their patients. Check out this post from last year on Oschner’s program! Yet, in the field we are all aware of the regulations around electronic health records and those devices that work with them are one of the grey areas – one that we, in the healthcare technology field hopes will stay grey! What have your experiences been with your Apple products and your healthcare providers? Can technology help you make better health care decisions? In previous blogs I’ve talked about using technology to improve your health, such as this one on apps. Most apps today are still focused on general health and wellness. Even though that is the case those apps can help people with chronic conditions monitor those conditions. For instance, the Fitbit can monitor your pulse/heart rate. This is great if you have a heart condition. Now picture yourself faced with a decision, large or small, about treatment for your health decision. Do you solely rely on the doctor’s advice? Do you have a discussion with the doctor weighing the options and the pros and cons? Do you Google it? What if there were an app to help you review your issues/symptoms? What if it could help you to evaluate the risks? I think most people would like to have that assistance – especially with the “big” decisions – surgery, cancer, etc. Then add to it that your can possibly review your own health records (check out my blog post on OpenNotes). This can help you understand your health as a whole. There are also decision aids that help translate the medical talk – you don’t have to go to a medical terminology class now to understand those words! Take a peek at the article in the Wall Street Journal’s article on getting patients to take more control of their medical decisions. Have you used apps or decision aids in making decisions about your healthcare? An App Here, An App There…. Back in the late 2000s the apps were mostly driven by the health providers such as physician practices and hospitals. They were also many that were related to specific disease states or information that was gathered from the patient at the specific hospital or physician practice. Now we are seeing a trend, one that has been growing for a couple of years, of apps targeted toward exercise and diet. You may have a Fitbit or an Apple Watch, use My Fitness Pal or other apps to track what you do, what you eat, what your pulse is and how long you exercised. But a lot of the apps fail to satisfy the users need. They may be too complicated to use, take more effort to input information or just simply don’t do what the app advertises. For instance, I have a Fitbit and originally wanted it to track my sleep. But it is not consistent so I just can’t rely on the information. A lot of the apps that you might have on your phone, iPad or such you have to either read the label and input the information about that chocolate chip cookie or glass of almond milk that you just consumed. Some are sophisticated enough to scan the barcode of the product and take the information from there into the app. So what has your experience been with apps for your health? Did you healthcare provider point you to helpful ones? Do you use apps that are specific to your disease state – as in the case of diabetic monitors? Or have you just seen others using these apps on Facebook and thought that might work for you? Individual and community level health information exchange is the most recent focus of ONC funding continuing the journey to move us close to seamless interoperable health information exchange. Do YOU Own YOUR Health Data? I’ve been following the “ownership” of patient health care data for probably over 12 years – since I started full-fledged into healthcare IT – that’s at least how long those in the industry have been talking it over – and over, and over, and over. So it was much to my surprise to come across an article that laid out who owns the health data – you or the provider or the healthcare company. 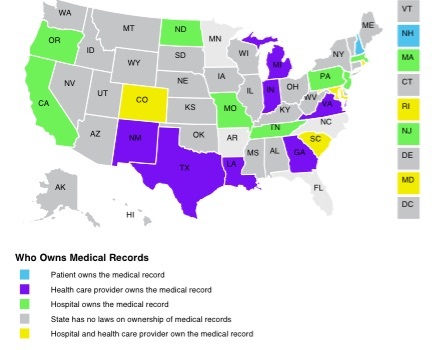 I was even more shocked to find that there are states that will not release your own health data from your physician/healthcare system without a court order!!! Wowser!! Won’t see me moving to South Carolina or New Jersey or visiting a doctor there unless I’m in a life or death situation! But you are in luck if you live in New Hampshire – you own your data according to “Revised Statutes of the State of New Hampshire 151:21” So yup, I would definitely be comfortable their having MY health data. Medical records may be owned by a physician’s employer, including include group practices, professional associations, and non-profit health organizations. That word of “may” tricks me up…does that mean they “may” give me a copy without that court order like South Carolina wants or they “may” decide they don’t want to give them to me? Clarity, folks, clarity!! So here is the infographic/map if you want a quick look… but thought you might find this a little interesting. What do you think of your state’s laws or lack of? Courtesy of this great article! How much is your healthcare information worth on the “black” market? According to an article in Reuters, your information from a healthcare hack can sell for $20 or more on the black market. Why, you ask? Because that information is much easier to use to paint a whole picture of a person and their identity than the previously targeted financial data. They can use the healthcare data to receive medical care, obtain prescriptions, and use your social security number and date of birth to obtain credit in your name. With the financial sector locking down their information in response to the many hacks of late years the healthcare industry is an easier target as they have not been previously worried about hacking. Reviewing Health and Human Services reports of data breaches where more than 500 patients were exposed, the Brookings Institution found that the number went from just 13 in 2008 to 256 in 2013, impacting 9 million in 2014. Healthcare systems that are hacked and have the weak security can/will be fined up to $1.5 million dollars – which should serve as incentive to tighten up that security. What does this mean to you? It means you should keep an eye on your credit, listen to the news for reports of hacking, and you might even ask your health care provider and other healthcare entities if their security is appropriate. Of course, most of those clinical providers on the front end (those doctors & nurses) probably can’t answer the question as it lies deeper in the organization or operations, such as the information technology department, so don’t be too upset if they can’t tell ya about it. What’s in store for mHealth? From the 2014 mHealth Summit they had 4 “take-aways” – all four were ones that we have heard before and ones that we should be listening to. I’ll start with the easy one, in my opinion – (and their #1 on the list) – Consumer Engagement is the buzzword. I’ve been talking about this one off and on for a while. We are a culture that is becoming more informed. We have access to health information much more easily than those who have come before us. Google, WebMD, and just about any health related organization, such as providers and support sites. For me, personally, I am paying attention to more on the Breast Cancer site than before because my mom is fighting breast cancer. And we’ve talked before about access to your own health information and how we all want to see what our health record looks like and find out what did the doctor realllly say in my last visit with him/her? The next one, in my numbering system, is that Apple’s HealthKit could be a game changer. I’m still waiting on this one. It could be the game changer – I hope it is the game changer. Basically, it could connect all those wonderful health apps to the Apple Health and keep all the nifty data there for us. Well, that brings me to my favorite of the 4 – data analysis! Now, I hope I don’t lose my non-nerd friends on this one (as my kiddos would say). I am blessed to have just started a job with a company that provides data analytics to health providers. And, let me say, WOW, I am excited! This is the meat of it all! We have sooooooooo much information on our health, health standards, metrics for health measurement and just oodles and bunches of good stuff that can help us monitor our health as individuals and as communities! We are capturing data in mobile devices, devices worn on the body, devices used in the practice of health care, electronic health records and even in the data that our insurance company holds on us – well, except Anthem – they can’t seem to hold onto our information…. (sarcasm). This is great stuff. It is time we put it to good use! So – what do you see in store for mHealth in 2015? It’s crisp and clear in Cleveland, Ohio. A good way to start my day at the Integrating the Healthcare Enterprise (IHE) North American Connectathon Conference. I love the smell of hot coffee intermingled with the sound of amplified speech-stirring thoughts about health IT interoperability. Check out the talk on the Facebook page! Like to read the posts hot off the computer keys? Sign up here for the email subscription! As a healthcare technology professional, Tisha Clinkenbeard has managed EMR implementations, IT departments, and implemented many different clinical systems. Additionally, she has a master’s degree in information systems. Tisha has experience spanning over 25 years in the healthcare sector in multiple clinical settings such as hospitals, physician practices and pharmacy. With her avid interest in healthcare and the technology that enhances or improves the patient experience and outcomes she works to share with you what is happening in the world of technology as it affects the patient. Tweet with me on Twitter! !